It has become clear that connection to nature is critical to our mental and physical wellbeing, yet we are spending less and less time in nature. Research has shown the negative effect that the decline of daily contact with nature has on human wellbeing, for example nature deficit disorder in our children. Humans need nature and experiencing and being connected to nature aids development and health in children and adults. Knowing this, over the past few decades people have been developing the concept of ‘biophilia’ and its application through biophilic design. 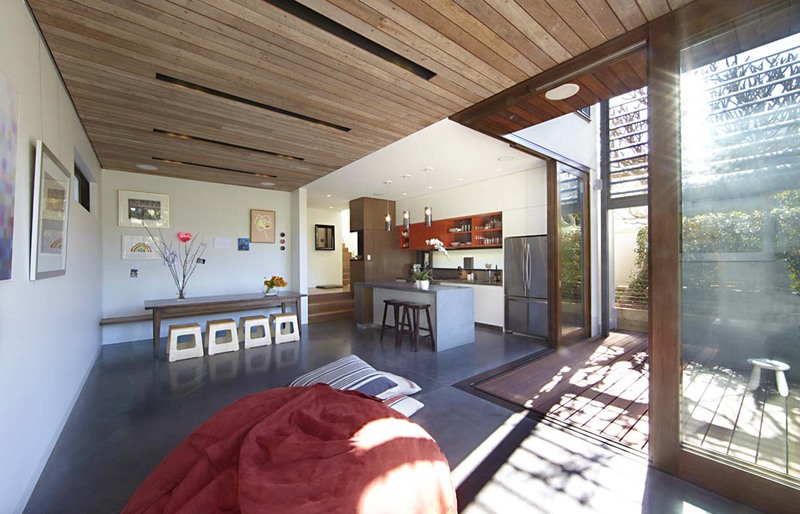 Biophilic design recognises it is not just the plants that humans respond to. It is the patterns, forms, materials, places, spaces, sounds, smells, seasons, light and so on that can trigger positive feelings of wellbeing. Views of nature, even pictures, can assist and speed hospital healing times and decrease the use of anaesthesia. Exposure to nature can reduce stress, shown by lower heart rates and stress hormones. Globally, many companies are finding that increasing nature in the workplace improves productivity and creativity. Yet it is not just the social benefits that result from nature exposure, there are also significant environmental benefits. Plants can clean air, release oxygen, reduce carbon dioxide, create cooler micro-climates, insulate and protect buildings and help manage stormwater. Biophilia, when interpreted through biophilic design, helps reduce everyday stresses by providing people greater daily exposure to nature and bridging the gap of disconnect. This highlights the need for a more integrated approach to the design of cities with nature as the ‘connector’. There are many spaces and gaps in the urban fabric that can be filled by nature. A biophilic building, for example, can spill out and flow into its surrounds, and vice versa. And street trees no longer need to be in solitary confinement but can be supported by small gardens. These approaches bring social, environmental and economic health. In a recent project that explored the plant-life balance, Thrive Research Hub looked at 101 studies around the world to examine the benefits of nature and plants on our physical and mental wellbeing. 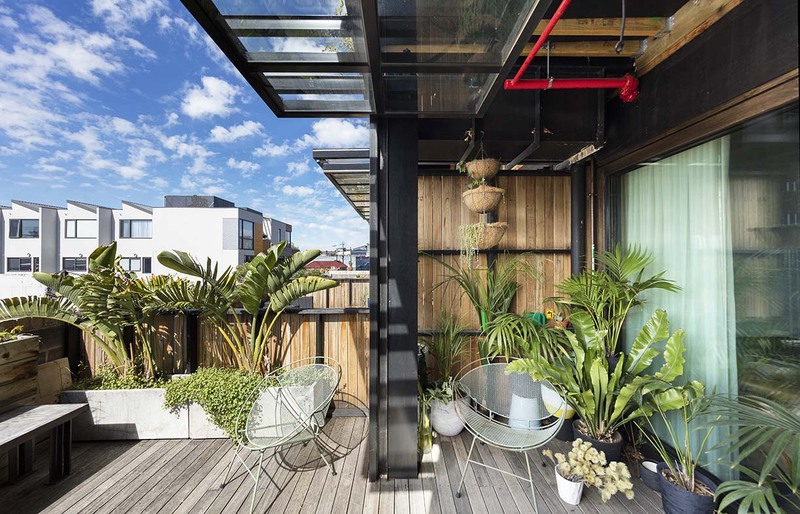 They overwhelmingly showed that plants are great for health and happiness; from removing toxic airborne pollutants to improving mental health, greenery brings life into your space in more ways than one. The science backs this up too. Just one plant can improve air quality by 25 per cent and adding up to 10 plants can see maximum health benefits. When it comes to wellbeing, by adding a mixture of sizes and varieties, you’ll experience the biggest improvements in mood, concentration, productivity and positivity. Key insights from the plant-life balance research include access to greater quality of life through connection to community, neighbours and environment. This includes enhanced healing and wellbeing, reduced social problems and improvements in productivity, concentration and memory, and intuition and connectedness. 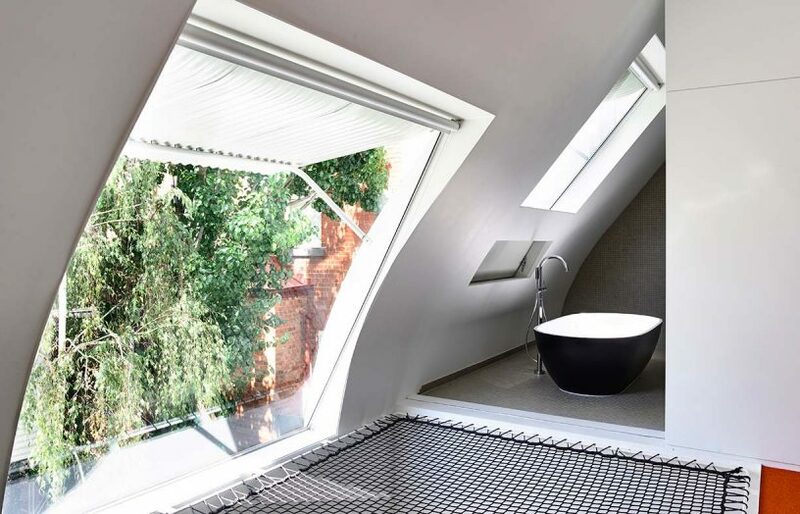 We are beginning to see designers trying something new, pushing the boundaries on sustainable design towards places that are not only environmentally sound, but which also renew the mind and body. 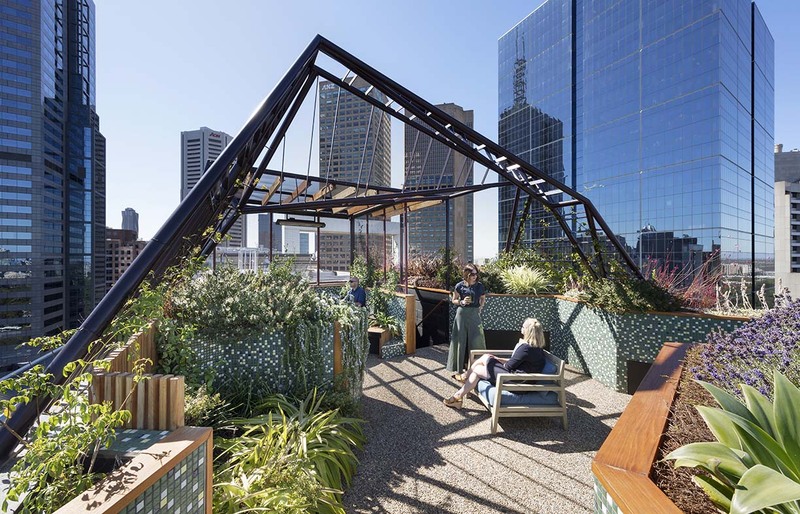 This rooftop garden uses patterns, including spider web-like shading structures and gardens, to connect residents with the order and chaos of the natural world. 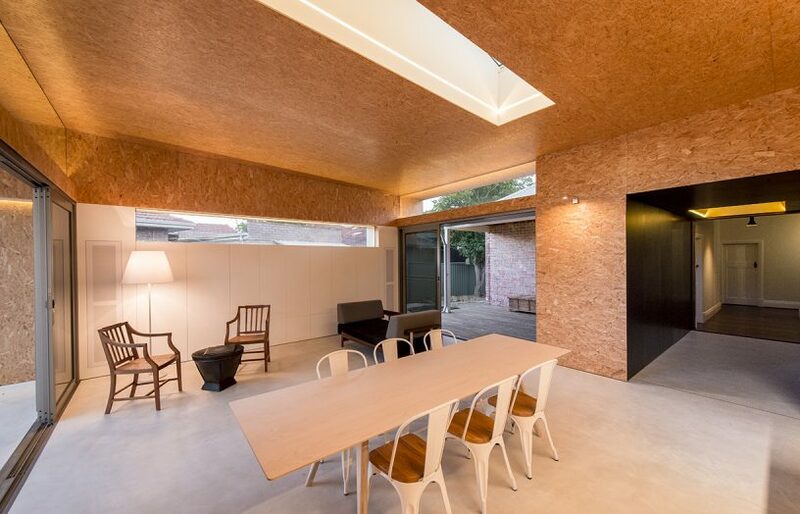 Image: Di Snape, taken at Bent Architecture’s Phoenix project in Melbourne. 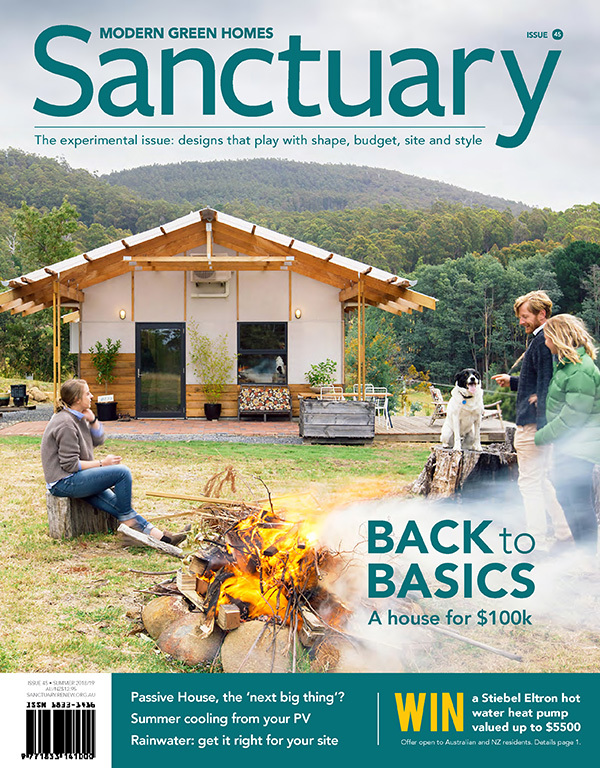 – Prospect, refuge and mystery (playful spaces, including nooks for kids – and grown-ups!). 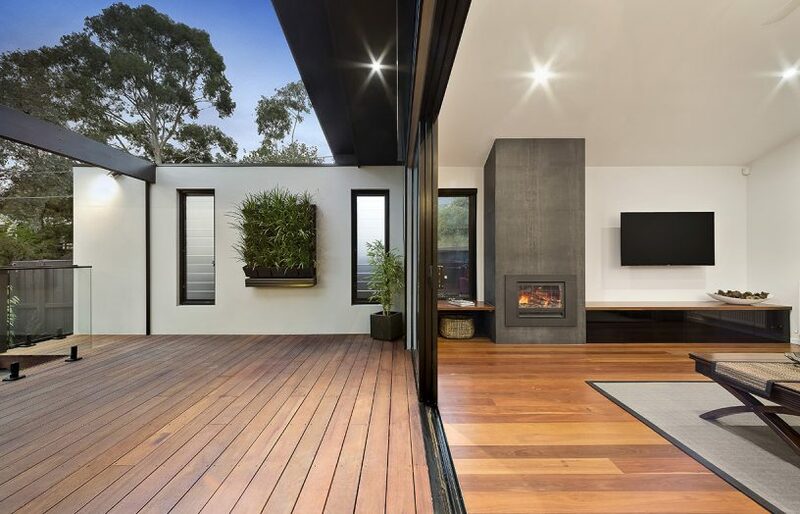 To help you dive into what this could be like, there are some renowned and also contemporary examples of residential houses in Australia and around the world that demonstrate these ideas. Frank Lloyd Wright’s Falling Water in Mill Run, Pennsylvania USA, is a stunning example of many of these patterns. 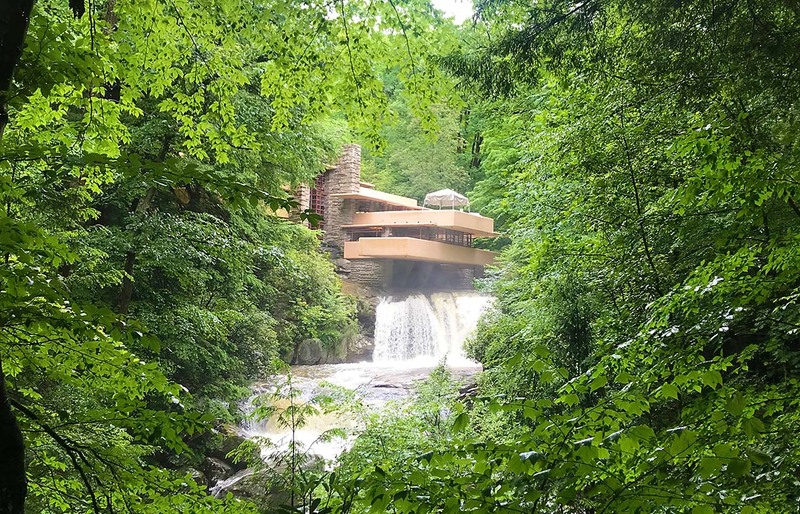 Most obvious are visual and non-visual connections to nature, presence of water and connection with natural systems, which arise as the house sits on the edge of the waterfall on the creek that the client so loved and enjoyed. The water is ever present to see, hear, feel, smell and even taste as the house opens up to it in so many ways. 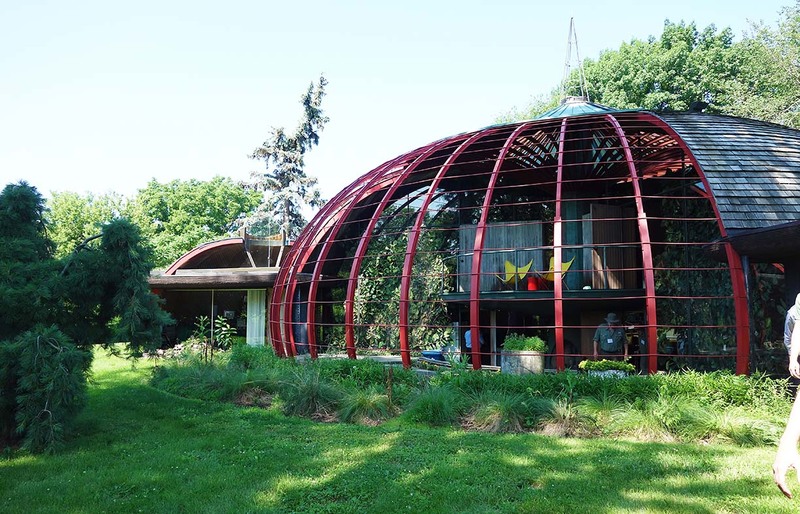 Bruce Goff’s Ruth Ford House in Aurora, Illinois USA, is a ‘bird-cage like’ home that shows how biomorphic forms and patterns can create beautiful spaces that are poetic and joyful. 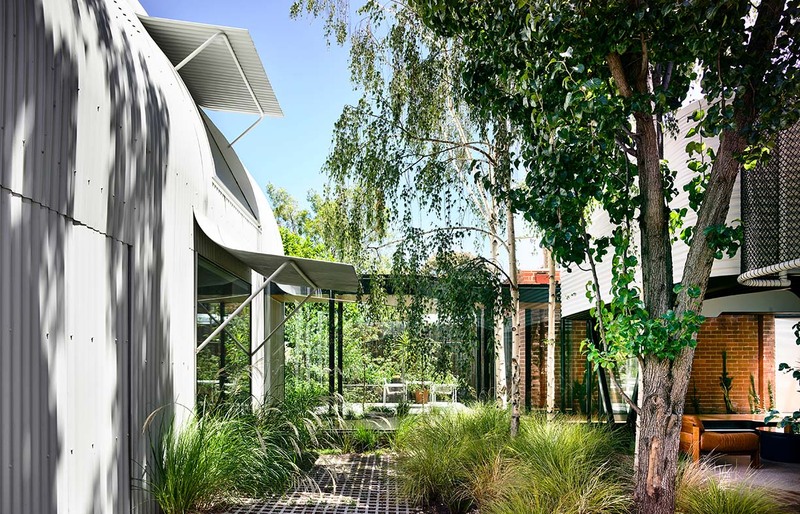 The quonset steel arches are arranged to create a central dome for the house (around which smaller domes are connected), which is both clad and exposed to reveal the beauty of the structure. 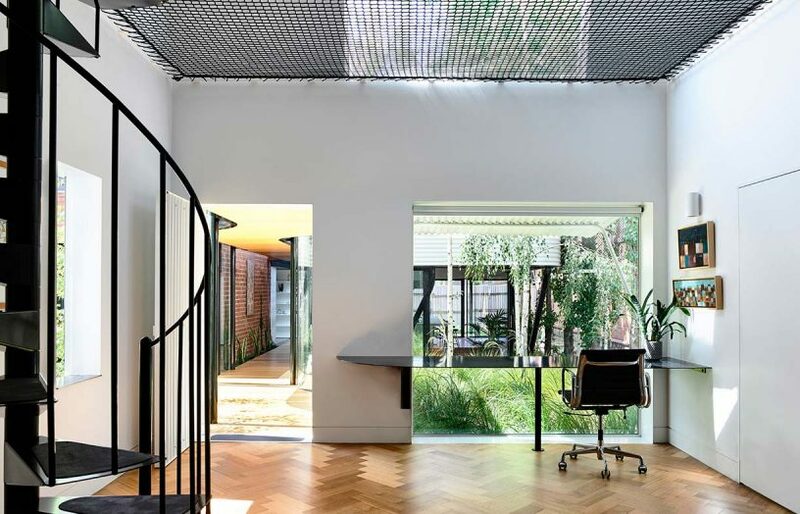 The Lloyd Residence in Clovelly, NSW is a residential alteration by Pidcock Architects, designed to blur the boundaries between inside and outside. The double-height external terrace that is screened to the north and above celebrates the beauty and playfulness of dynamic and diffuse light as the house enjoys a visual connection to nature. 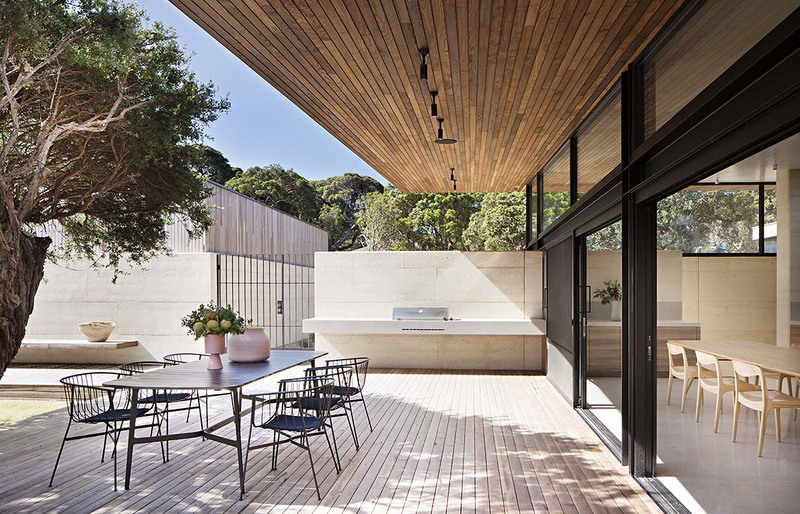 And Pidcock Architects’ Wauchope Residence in Wauchope, NSW added a series of new pavilions to the original slab timber house, that step around beautiful garden spaces as they pay respect to the original section. This has created some wonderful options for prospect, refuge and mystery in an arrangement that has both complexity and order. Robson Rak’s Layered House on Victoria’s Bellarine Peninsula explores a meaningful connection with natural systems and material connection through the use of rammed earth for walls and timber for floors and ceilings, while opening up to a native garden that is designed to change through the seasons. The Nightingale 1 and Commons buildings in Melbourne show us how we are incorporating biophilia and connection to nature and community in medium- and high-density living: the apartments have a lot of natural light, internal plant- and light-filled atria, roofs with vegie gardens and places to relax and be together. You can immediately access free online apps like Plant Life Balance, which are helping overcome the knowledge barrier to creating biophilic spaces, with more than 47,000 downloads since launching 12 months ago. This app was developed with support from the horticulture industry to make it easy to integrate plants into your home both internally and externally in courtyards. Follow and use the work of groups like the University of Melbourne’s Thrive Research Hub and Griffith University’s Adapter, who are working to show the importance of integrating this kind of nature-loving design as quickly as possible, to build resilience in the face of more extreme weather events over the coming years. These researchers are reshaping the context for engineering and built design, to think of business as usual solutions that are place-based, nature inspired (biomimetic) and nature loving (biophilic). With shrinking living spaces and gardens, and social media trends, there is a strong and growing interest in houseplants for our homes and workplaces. We await with interest future research into plant-life balance, finding ways to sustainably integrate this type of nature into our cities in ways that are good for the environment and people. Natural materials, dappled light and pot plants are simple and effective ways to connect with nature. Image: Di Snape, taken at The Commons, Victoria. Louv, Richard (2005). Last Child in the Woods: Saving our Children from Nature-Deficit Disorder. Chapel Hill: Algonquin Books of Chapel Hill. Wilson, Edward, O. (1997). ‘Biophilia and the Conservation Ethic’, essay in The Biophilia Hypothesis, edited by Stephen R. Kellert. Dominique Hes is director of the Thrive Research Hub, University of Melbourne, and a Greenfleet board member. Cheryl Desha is director of the Adapter Research Group, in the Cities Research Institute, Griffith University (Brisbane). Caroline Pidcock is director of PIDCOCK Architects and a prominent advocate for sustainable development, based in Sydney. Jana Soderlund is director of a Perth-based consultancy Design by Nature, specialising in biophilic design and green infrastructure. 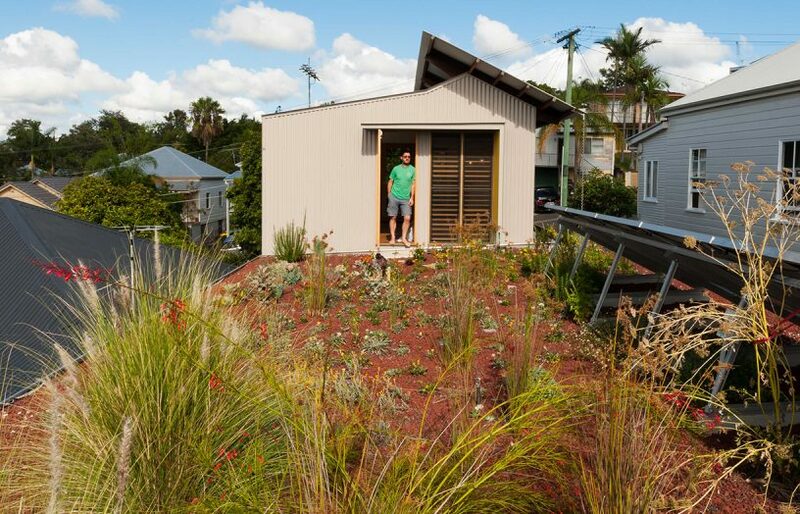 The site of a former Greek community garden inspired an outward-looking approach for Mark and Lisa’s Brisbane house design, securing its food growing legacy and plentiful green space around and above their new home. 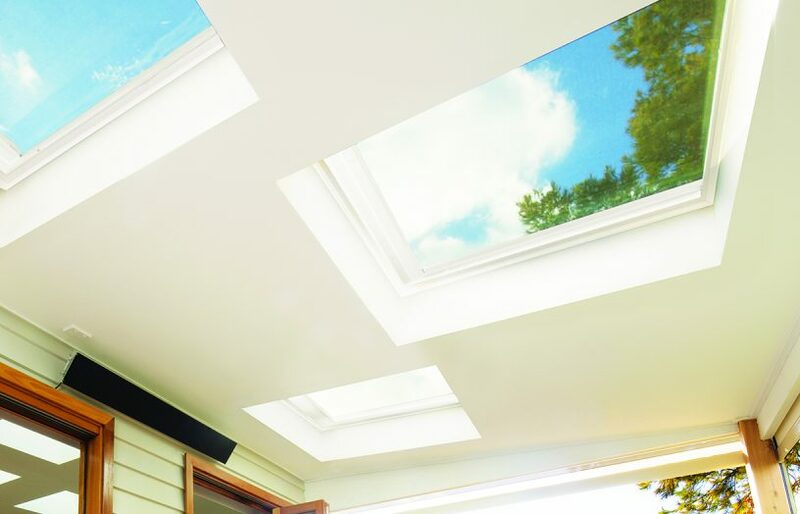 With the advent of solar-powered LED technologies you can now bring ‘daylight’ into your home or apartment without compromising the building envelope – but if you want the real thing, there are several energy-rated skylights on the market. When accessibility principles are applied to beautiful, thoughtful design, timeless infrastructure is created, writes Melissa Wittig.